Sweeping boulders, trees, houses and people before it, a landslide can thunder down with terrifying speed. Mountainous New Zealand, already prone to the triggering factors of earthquakes and rainstorms, is vulnerable to these dramatic and destructive events. A landslide is a natural process that carries earth or other material down mountains and hillsides, or on land around the coast. New Zealanders often use the word ‘slip’ for a landslide. Some landslides bring down a mountainside, and travel at 200 kilometres an hour. Others are shallow or slow, moving only a few centimetres a year. Landslides also move in different ways, such as falling, sliding sideways, or flowing. New Zealand has steep mountains with rocks weakened by earthquakes, and hillsides of soft rock. The most common landslide is shallow and fast, flowing like wet cement. New Zealand’s landslides often happen after a rainstorm and may damage roads, railways and farms. In the Southern Alps and other mountains, rocks can slide, sometimes in a huge avalanche. 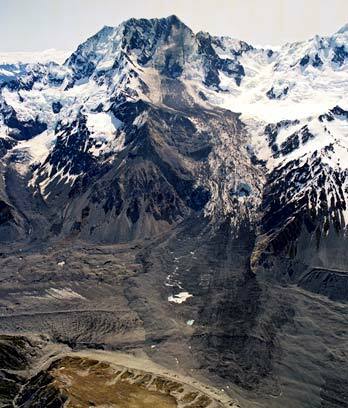 Twelve million cubic metres of Aoraki/Mt Cook fell away in 1991, lowering the peak by 10 metres. A flow of melting snow can quickly carry large blocks down a mountain river bed. This is called a lahar. In the North Island hill country, especially the East Coast, some rocks have slumped and moved sideways. This often happens slowly, but sometimes sheep have been buried by a rapid slide. Some flatter land has layers like a custard square. The harder ‘crust’ on top squashes the softer ‘custard’ underneath, and then the top layer falls down. This happened in 1979 at Abbotsford, Dunedin, when 69 houses collapsed. Waihī, Lake Taupō, 1846: After heavy rain, a mud flow smothered 55 people at a Māori village. Murchison, 1929: A major earthquake caused landslides that killed 14 people and blocked the roads for months. Laws about buildings, roads and farming reduce the risk of landslides where people are living. Orange and yellow road signs warn motorists to be careful.